David Plattis pastor of the Church at Brook Hills in Birmingham, Alabama. He holds a Ph.D. from New Orleans Baptist Theological Seminary and is the author of the best-selling book,Radical: Taking Back Your Faith from the American Dream. This book will challenge your perspective and lead you to complete abandonment for Christ. I have lost track of how many copies of this book I have bought - well over 20. I wanted all the leaders at our church to read it, and my family members too. Because I need all the reminders I can get that this life is not about me and my comfort (or even those I love around me) but about Jesus and his glory. This book challenges many of the common-sense things we do that seem reasonable but often are steps away from trusting God towards relying on ourselves. Uncomfortable to read - but that's how you know its important!! This book is short enough that you can read it in an afternoon, and long enough that it can make a lasting impact on your life. 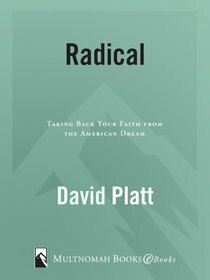 Platt uses personal stories and scriptural references to show how we as a Western society have fallen into the trap of being comfortable in our Christianity, when we should be making ourselves uncomfortable for God. What stood out to me most was gaining an understanding that there are so many people in the world that have never heard the name of Jesus and as Christians it is our job to make sure that they hear it - God didn't make a plan B.
I recommend this as a must read for every Christian, especially if you feel that familiar God-itch to begin making a radical change in your life and your culture. This was definitely worth reading, and has helped me to take steps to change my life for the better (I've now been encouraged to work towards setting aside some money for the disadvantaged and for the Church, instead of languishing in my wealth. And I've realised the importance of spreading the message of God both in the community and through overseas mission work) Want to know why? David Platt will tell you, with his experience as a pastor leading a large church, and doing mission work and hearing the stories and struggles of poorer communities. My only concerns are that it is a bit pricey and when discussing megachurches is geared towards the US, although I believe it is important to hear about Christians all over the world living together in Christ. The book still has a very powerful message and practical, realistic, key points to take away!! I would recommend it for adults and senior high school students. In this important book, David Platt challenges the Christian reader to examine whether our Christian faith has been influenced, compromised and hence cheapened by the surrounding culture and its values-system. Accustomed to "worshipping" Christ in multi-million dollar comfortable facilities and following Him with many so-called discipleship programmes which meet our felt-needs, today's Christians might have lost sight of what it is to follow Christ with utter abandon and sacrificial commitment. If Christ is Who He claims to be and if Christian discipleship demands nothing less than giving Christ all that we have, we cannot but be His radical followers who would love Him more than we love our security, money, convenience and even family. Reading this book, one cannot but be deeply challenged by Platt to take our discipleship seriously and to follow Christ with utter abandon! Highly recommended.